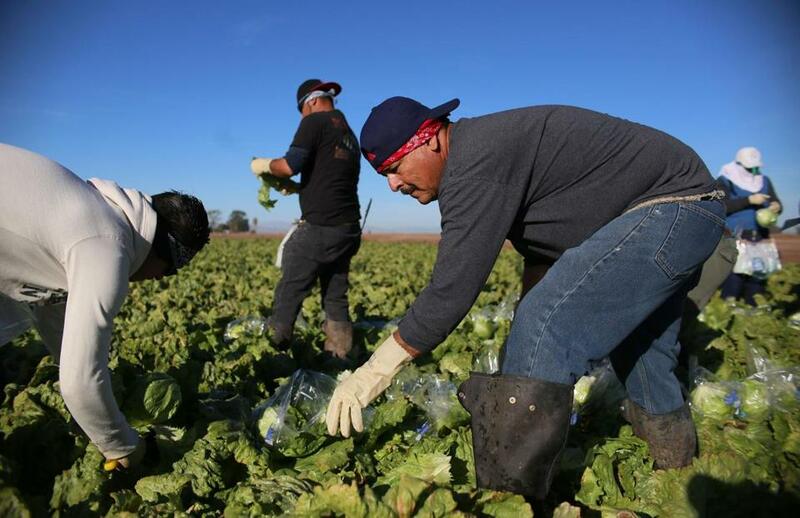 Mexican farm workers harvest lettuce in a field outside of Brawley, Calif., on Jan. 31. Media pundits, academics, and commentators alike are scrambling to provide insights into the likely effects of President Trump’s policies. One of his most controversial policy goals concerns the mass deportation of millions of undocumented immigrants currently living and working in the United States. Experts have been grappling with how this policy will affect our food system and — most importantly — how much we will have to pay to put food on the table. In fact, Trump’s anti-immigration stance is bound to increase food prices profoundly. But it will also expose the industry’s open secret about who grows our food. Trump’s policy goals may soon force Americans to confront the fact that we rely heavily on undocumented immigrants for more than half of our food labor supply. While these two topics are rarely linked in policy discussions, up to to 2 million of the people who pick our fruit and plant our crops are undocumented. They account for 50 to 70 percent of total US farm workers. Today’s food prices are artificially low because we use underpaid, overworked, unprotected labor. Silenced by fears about their immigration status, and with few activists to champion their cause, farm workers have the fewest protections among US laborers. They work excessively long hours, are paid well below a living wage, and often below minimum wage, suffer poor living conditions, and earn no vacation, overtime pay, or health insurance in most states. This has created a disturbing paradox: Those who grow our food are one of the most food insecure populations in the nation. The agricultural lobby and Trump’s own farm industry supporters have profited for decades from this steady supply of cheap, undocumented workers. The 1942 Bracero Program brought Mexican laborers to US farms, and, since 1964, this practice has continued unabated while government and industry-backed enforcers look the other way, or even push policies to further exploit immigrant labor to bolster profits. Over the past decade, an increase in deportations and stricter immigration policies have begun to shrink the United States’ agricultural labor force. The produce industry is currently experiencing $5 billion to $9 billion in annual losses due to labor shortages. Georgia, Florida, and California in particular have suffered significant dips in farm productivity due to laborer shortages, a trend seen nationally in restaurants. Facing financial losses and a drop in production, many employers and right-leaning congressional representatives have demanded legislation such as H-2A guest-worker reforms to reinvigorate the supply of cheap immigrant labor. Trump’s policies promise to create a critical labor gap, forcing farmers to switch crops, decrease production, or increase spending on legal labor. Their costs will be passed to the consumer. The numbers are alarming: Researchers predict a 61 percent drop in fruit production, 27 percent drop in meat production, 31 percent drop in vegetable production, 30 to 40 percent drop in average farm income, and a 5 to 6 percent increase in consumer food prices at the supermarket. One study found that a 50 percent cut to immigrant dairy workers would mean a milk price nearly double that of today. There will be international consequences as well. Canada imports much of its produce from large US agricultural states; its citizens are likely to see a rise in food prices, according to Canadian business scholars. Ironically, the nonpartisan Economic Policy Institute has suggested that paying all US farm workers, regardless of immigration status, a living wage would end up costing less to the consumer — a 3.7 percent vegetable and fruit price increase — than the estimated 5 to 6 percent increase under Trump’s stated deportation goals. The crucial point is not that Trump’s policies would devastate a functioning agricultural industry; instead, they would expose a widespread exploitative labor system that industry and government leaders alike have quietly supported. Key conservative constituencies may soon find themselves fighting against the president’s policies, igniting debates unlike those we traditionally see between the right and left. We all eat. We are all part of the silent status quo. The United States’ large, systematic, and violent reliance on the undocumented worker implicates all of us. In focusing on this vulnerable population, Trump may have unintentionally forced a national conversation around immigration and food justice and perhaps ignited unlikely political alliances. It’s a conversation our nation has avoided for far too long. Sydney Giacalone is a senior studying food justice through anthropology and environmental studies, and Julian Agyeman is a professor of urban and environmental policy and planning, at Tufts University.